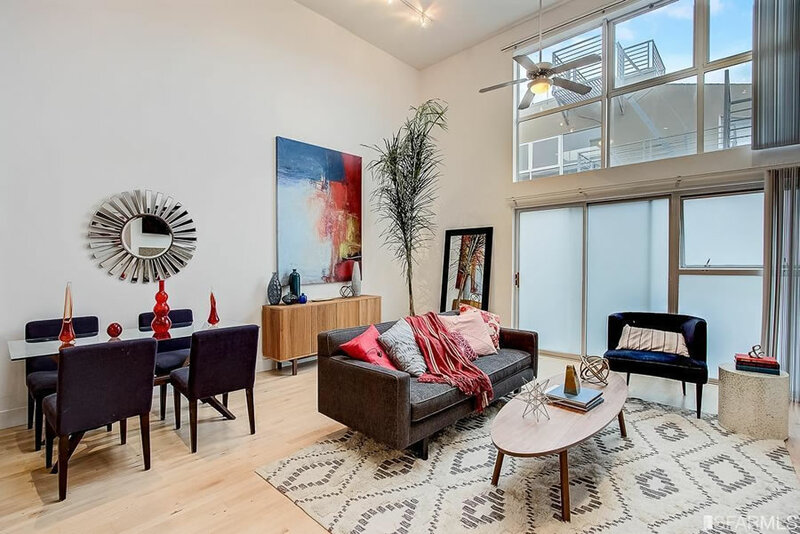 Purchased for $1.185 million in December of 2015, the “modern, stylish, tri-level loft” #14 at 175 Russ Street, “located in the heart of SOMA,” with easy access to tech shuttles and company headquarters, as well as to Whole foods and “countless restaurants and cafes,” returned to the market priced at $1.195 million this past August, a sale at which would have represented nominal appreciation of less than 1 percent for the condo since the end of 2015. In addition to its 1,361 square feet of living space, the two-bedroom unit includes a deeded parking space and storage. 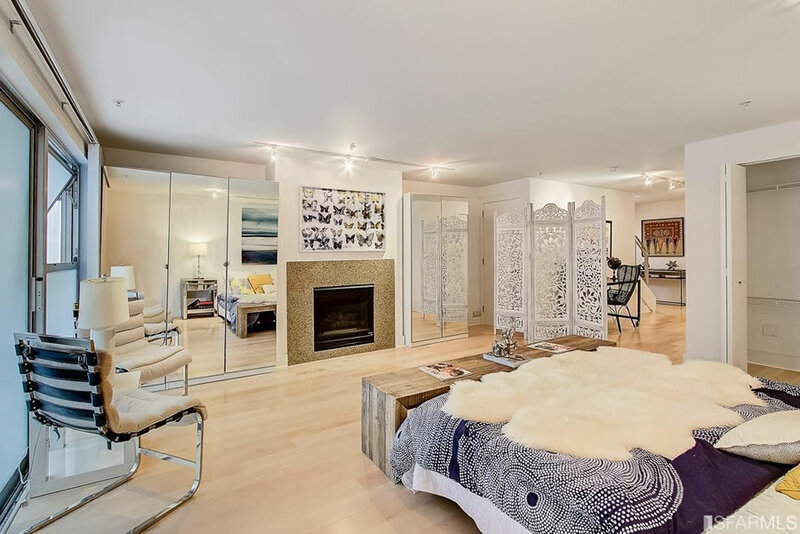 And having been reduced to $1.095 million in September and then withdrawn from the MLS, 175 Russ Street #14 has just been listed anew with a “$995,000” price tag and an official “1” day on the market according to all industry stats and reports. If you think you know the market in SoMa, now’s the time to tell. And yes, while inventory levels are actually up, not down, in San Francisco, pending sales volume is, in fact, down. NYT has a new article (link in name) suggesting that people may be waiting to sell until after the expected wave of IPOs; it will be interesting to see how those affect the inventory/sales equilibrium. And yet, inventory levels are actually ticking up in San Francisco and pending sales activity is down (no word on what happened to all those newly minted JUUL millionaires). The Juul wealth creation happened, and they’re buying things that are written about on Socketsite. So there you go, word. And yet, both pending and closed sale volumes in San Francisco remain down. Perhaps that’s because October sales actually closed down a smidge in San Francisco, not up (despite what that “email from a realtor” who sends out a newsletter about this stuff said). And since then, sales volume has been down an average of 14 percent on a year-over-year basis, with January sales dropping to a 10-year low. So there we go, indeed! YoY prices were up in October by ~5% and sales volume was down by ~1%. Odd spot to pick there, in multiple ways, one of which being is Juul hadn’t happened at that point in time. We can’t help you if you don’t understand the difference between changes in the median sale price versus actual values. Regardless, October sales volume was actually down, not up, despite what your newsletter and retort implied. And the decline in volume has actually accelerated since. Not needed, thanks. But it is understood that Socketsite switches between talking about volume and talking about price as necessary. OK then. Are you aware YoY SFR sales volume was actually up this February? We were not! And in fact, once again, you’re wrong (they were actually down, as were condo sales). But inventory levels are up. None of which should catch any plugged-in readers by surprise. They were up slightly 110 over 106 and you are once again (pedantically) wrong, Now back to your regularly scheduled vague foreboding. You might want to wait for the recorded sales figures, versus a query of the MLS (or relying on the same “newsletter” that led you to claim that “October sales are going to be up,” when, in fact, they were down). And it’s only “foreboding” if one is uncomfortable with the data and trends at hand. So I should wait for the recorded sales which you’ve also not seen while telling me I am wrong. That makes sense. Oh wait. No, it doesn’t. And again, October was up in price and almost identical in volume. Yes, your vaunted “pending” database which you do not share with the public. Meanwhile, the MLS numbers are out, for SFRs in February, and you archly dispute them, yet you’ve got nothing to stand on. I am done with this irrelevance now. You’ve completely missed this market. We’re not sure what to tell you if you’re hanging your hat on incomplete MLS stats, or even worse “analysis.” But hey, whatever makes you feel better. And no, we’re not handing you our model(s) or database. You’ll have to settle for continuing to whine and whinge. I wasn’t going to respond to you because what’s the point. But I’d be remiss if I did not point out that your “pending” charting, that you claim to keep year in and year out, can only be from the MLS in point of fact. Yet here you are, disparaging my citation of MLS sales figures. There’s a word for that sort of behavior. Starts with an h.
And yet, somehow, while you said sales would be up, we said sales activity was trending down, which is what actually happened. Weird, huh? Two primary motives for selling (IMO only) are selling an investment or selling to move to another home. The investment side I can see, but if you are planning to move to another home, life may take precedence or the home you plan to move to would similarly be impacted by any IPOs on the horizon (unless moving out of the bay area). Any stats on % of one bucket to another? I see it might have some impact, like the entire idea of Airbnbs, but to really impact the larger trend in the market seems distant. Keep in mind that you’re quoting from a fluff piece in the Style section of the NYT. Just read that article; thought it was terrible. You know it’s fluff when the first half of the article interviews four real estate agents who unsurprisingly talk up the market in a huge and sensationalist fashion. I’m guessing there is not much research or information behind the “ten thousand millionaires” comment, yet it is the kind of thing that people will remember and pass on. What is the distribution of stock and the vesting schedule vs the performance of these companies? What is the actual impact on r/e? From the perspective of a r/e agent it doesn’t matter as long as you can work other potential buyers into a frenzy to beat the rush. It will be interesting to see what happens. Uber has done nothing but lose money in a spectacular fashion: $4.5B in 2017 (ex-ing out special factors), Q3 2018 -1.07B; Q4 -1.2B (ex-ing out special factors again). Also, revenue growth has slowed dramatically since Masayoshi Son took a ~15% stake. And they are no longer on the map for the autonomous competition (the former CEO basically said they are done if they aren’t first to autonomous). I’m not saying Uber will have the trajectory of a Blue Apron. They have too much infrastructure and too many huge names with a huge amount of money in it. But it’s hard to be losing that much money with slowing revenue growth. Maybe you can justify it with huge growth numbers in certain markets for a time, but they don’t have that right now. My guess is the market would be happy with shrinking losses initially. And I’m not a housing bear nor bull. 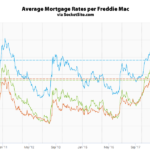 Higher rates is going to be a very slow, multi-year process and to a certain extent full rate normalization may never happen. And separately, I know a fair number of people who are reconciling now with taxes/the SALT effect and the effective elimination of property tax deductions. And some had stretched to buy condos/sfh’s counting on both housing appreciation and property tax deductions/not having their taxes go up in the tax cut. But I also know a couple of couples who still believe– who are stretching things out because r/e can only go up. I agree the article was terrible; I’ve seen the same line about “ten thousand millionaires” reverberate all around. I’ve been in the tech industry for a long time, at startups and public companies. Here are my thoughts on the number. * The wealth threshold an employee will use is to have $1M in cash *after* taxes so they can use some of their cash to make a sizable down payment, ending up with a loan they can afford as well as a chunk of savings in addition. (E.g. $500k down payment on a $1.2M condo) Anyone back this up based on small condo / home prices we might expect the “average” employee to seek? This is one assumption that may not be generous enough. They likely cannot early-exercise their options, which means they must exercise at the time of sale, incurring ordinary income gains. At that level, let’s swag 50% in taxes so they need $2M in options. Let’s say the company IPOs at a $20B valuation. To get $2M in proceeds the employee must liquidate 0.01% (1bp) ownership in the company. Now let’s go back to our assumptions. If they’ve been there 2 years at IPO time and they want the money within a year of IPO, they’ll only have vested 3/4 of their initial 4-year grant, which means they must have been granted 1.33bp ownership. The strike price is also not zero; considering rocketship growth it may be 10-20% of the FMV at IPO. So now they need a 1.5bp grant. Employee option pool sizes at this stage are typically between 15-18%. And of course they’re not distributed evenly. At a $20B company there are probably no more than 1000 employees who could end up owning 1.5bp (that totals 15% and assumes uniform distribution). The real number is probably more like 500 but I don’t have a good cap curve handy to pin this down better. So, a $20B IPO, assuming the value holds, may yield 500 eligible buyers. Now multiply that by how many will ACTUALLY enter the market with this money in the ensuing year. 50%? 20%. That would be 100 buyers. A total of $100B in valuation with the same math would roughly equate to about 500 buyers. This is a full order of magnitude, and then some, less than the projected number. And again, I think we’re still being kinda generous. You could also start with the S-1 to estimate the amount of vested and unvested equity allocated to employees. It breaks out the senior execs, and the distribution among other employees should be less top-heavy. They say that RSUs are more common than options now, so the option price is zero. More importantly, there is no choice about when to exercise. Post-IPO, RSUs are ordinary income. To your ranks of potential buyers, I would add the people now stuck at the company for several years with a high six figure income, handcuffed to SF and stuck in the top tax bracket. There are no bargain assets out there, the tax code smiles upon those who own their primary residence, and a home purchase mortgage is the best way to borrow against unvested equity. I haven’t run the numbers, but unless one’s risk tolerance is very low, buying seems like a reasonable economic decision. I wonder what the financial planners are telling people. From the real estate agents’ perspective, it doesn’t matter if the IPO’s never happen. If they can use it to get people off the sidelines during this patch of slowness with fabricated numbers, then it’s a “success.” The article quotes an agent saying that average home prices of $5 million with all cash buyers is coming (no time frame). Ugh, what drivel. a yahoo article came out over the weekend (from VCs and those other than realtors) breaking down the real math on the post-tax millionaires, and their estimate was 5000 post-tax millionaires. my guess is 20% of these folks are already millionaires and own homes. they compared it facebook and google IPOs and the estimate is that this will be roughly 4x as many people as those 2 combined. But 3000 people may be looking, and i think its very fair to say at least 1000 will be looking on SF market. 500 is too low. There was *already* a secondary offering from Uber in mid 2018. A secondary offering is a financing round that lets existing shareholders (typically employees) sell shares to a single investor who agrees to pay a certain price to all comers. So anyone who wants a home probably already has one. Lyft allows the trading of employee shares (obtained via options or RSUs) on ongoing secondary exchanges. So their employees also will not need to wait for any IPO. So the effect of all these millionaires is already baked into current prices. And they are still falling, like loft that is the subject of this post. I’m sure it has an effect, but the effect is not sufficient to overcome the downward effects of higher interest rates, increased property taxes, reduced deduction for mortgage interest, and the generally increasing marriage age and decreasing birth rates. And more to the point, much of the pent up demand has already been released through these secondary offerings – it isn’t going to blow out 180 days after the IPO. Looks like just a rehash of the same 5,000 number coming from some so called big data realtor. tipster, most employees are not allowed to sell into a 2ndary offering. ive been through a couple of these, and that wasnt an option (not allowed). i dont think its an option now either. “Unlike the SoftBank deal, which allowed large institutional investors to pocket hundreds of millions of dollars, this deal is centered on cashing out employees. Current employees will receive the chance first to sell their shares; investors will only be able to part with their stock if space remains in the deal. That was about 8 months ago. There is no huge pent up demand, and they had an offering because the prior offerings weren’t allowing as many to sell, and those who could sell couldn’t sell as much. That tells me the employees wanted to sell as much as they could. Pretty much the exact opposite of your experiences. You came nowhere near to making that point. Lyft kicked off its IPO campaign Friday, and Uber, Airbnb, Pinterest and Slack are all believed to be going public in 2019. Combined, the four potential IPOs could reach a valuation of $176 billion and affect 10,000 San Francisco-based workers, which could, in turn, have a notable impact on the Bay Area housing market, Compass said. Emphasis mine. What this tells you is that Compass (quoted in both pieces under discussion here) has a really good publicist. This is the third place I’ve seen that “ten thousand” number. Look at this stuff after tax season, I think. It will probably start to take shape then if it does. Honest question: don’t realtors make their money on volume? They would be best served by lowering seller expectations so that there is actually something on the market when the cash starts coming in. That is how a techie would think about it least. Wait What!?!?! It’s now a ‘Next Tax Season After IPO-Effect’? If one of these companies IPO’s in June 2019 you’re saying we wont see a bump till April 2020? No. I’m saying next month, mid-April ’19 start taking notes. Why? The IPOs haven’t happened yet. Is it a ‘Tax Season before the IPO-Effect’. Or a ‘Tax Season after Secondary Markets-Effect’? But the secondary markets have been around for years. Why Now? Or is this just a ‘Make up some reason why now is the best time to buy-Effect’? Didn’t you just get busted for making up some newsletter nonsense about October sales? Because the Pax/Juul payouts happened, it wasn’t an IPO, and this is their first tax season. The other ones will be ongoing as others have said. Nobody got busted about anything, nothing is made up, and none of this stuff is spin or silliness. The other things you said are laughable. Busted, me? Indeed. Read it again. But four days ago you said ‘The Juul wealth creation happened, and they’re buying things that are written about on Socketsite.’ But now, ‘Look at this stuff after tax season, I think. It will probably start to take shape then if it does.’ Is it hard to keep things straight when you make everything up. And you got busted in Noe too! It’s not as if it is totally binary or something. With your question marks and your exclamation points and all. Take it easy. heh. It happened. Some of those folks are buying things. Most are waiting for the tax consequences to play out. How many people involved in that arc have you talked to, personally? I’m going to guess zilch. As for the 28th st house, yeah, I got that one wrong and I said so. Wound up being kind of an odd one though, we learned. Not sure how “busted” fits into anything. Real easy to keep things straight, actually. OK, but if the other IPO’s happen Are you saying that there will be no IPO-Effect until the next Tax Season following the IPO? So nothing until April 2020? Since you asked, I will hazard my own guess here. I think that we’ll see the Pax/Juul people in the marketplace noticeably after mid April 2019. Look at that group this way. How many luxury ~3M houses are even for sale total in San Francisco right now? I see 41 discounting off-market listings. Does it take a logical leap to surmise that Pax/Juul alone could color that market for a few quarters? I don’t see why it would. Moving forward I think we’ll see all sorts of things taking shape around the IPO events. Some people will have already cashed out in secondary markets. Some will necessarily wait for the actual events and the lockup periods to expire. Others will wait for both those things plus the subsequent year’s tax consequences. It’s going to be a mixed bag of human behavior. Not to mention, there will be those who leave the state for better tax haven states. Plus there will be those who buy elsewhere in California, and the Bay Area for that matter. But what’s true is that there will be significant wealth creation. Take the “5,000 new millionaires / eating SF alive / every house is gonna cost $5M” stuff with a grain of salt. Do not make the mistake of calling it all hype though. That’s what I think. Earlier, I paraphrased someone else’s newsletter and somehow that was a “gotcha” moment. Even though volume 10 2017 v 10 2018 was 585 vs 577, so within most people’s concept of margin of error. And even though price increased by closer to 5% YoY. Somehow I was busted and whatnot. Well, OK. Busted for saying what somebody else wrote. Here’s what I myself am writing in case you want to bust me later on. I think practically prices will show increase YoY beginning from a few weeks ago, and moving forward, over the next several near term quarters. Another source in her article, r/e agent Deniz K, also contradicts the 10,000 or 20,000 number; he is quoted in the yahoo article mentioned above as saying at least 5,000 new millionaires (not 10,000 or 20). And in another source, he says “If all the rumored IPOs happened we will see in the order of thousands of new millionaires.” Also, he mentions an average sfh home price of $5mm in the NYT article but no time frame (maybe it’s the same five years as the condo comment.) But elsewhere he is quoted as saying “”We probably expect a 50 to 100-percent increase in home prices the next five to 10 years, specifically in San Francisco for single-family homes.” 50% to 100% in five to ten years is a huge range but even taking his comments as unbiased, there is no way to get close to $5mm average sfh price (and all cash!). I wanted to see if there was any methodology behind these numbers so I did a one minute google search and thus found that her “sources” contradict one another and even themselves. Yet it is passed around as fact. I guess journalism is also sales. Also, if anyone is interested, one of the more recent and positive papers on the impact of IPO prices on housing within one mile and ten miles. Realtors rejoice! The spread of misinformation is easy! Had a facebook employee waited to buy a home for 5.5 years, they would have had ten times the money to buy a home. Buying a home at the IPO was literally the biggest mistake of their lives. This is cherry picking. The data suggests it’s always better to sell your IPO stocks immediately. Of course, there are exceptions but look at the data. All the joy at the supposed decline in prices and the enthusiasm for any article that suggests plummeting prices just means a vast audience of people who want to buy, which is in fact bullish. I admit that SALT is a threat. But on the other hand, we still have some protection from Prop 13. Hartford CT extorts 7% yearly tax. Parts of Chicago take 4%. When your tax bill is much greater than your mortgage, you’re really just renting from government. Predictable property tax in California is one of our few tax freedoms. Prop 13 doesn’t quite have the protection people believe. Govt, especially SF govt is voracious in finding alternative revenue for all manner of unlikely to work goody two shoe-isms. The last year I lived in SOMA, 12% of my property tax bill was listed as “special” and “temporary” on top of the prop 13 tax. Property taxes can (and always do) rise 2% a year but somehow the assessments/special taxes rose even faster. It’s only getting worse. Living in SOMA for the past 15 years I wonder how many in the real estate industry really get it, or are in denial? I mean the streets and alley’s of soma are the pits, I don’t care how close to companies you are nor how hip soma is suppose to be. The reality is something very different, the quality of living in soma is bad. Neither bedroom has an actual door? Well, it’s a loft, so that arrangement is not too uncommon for this type of property. 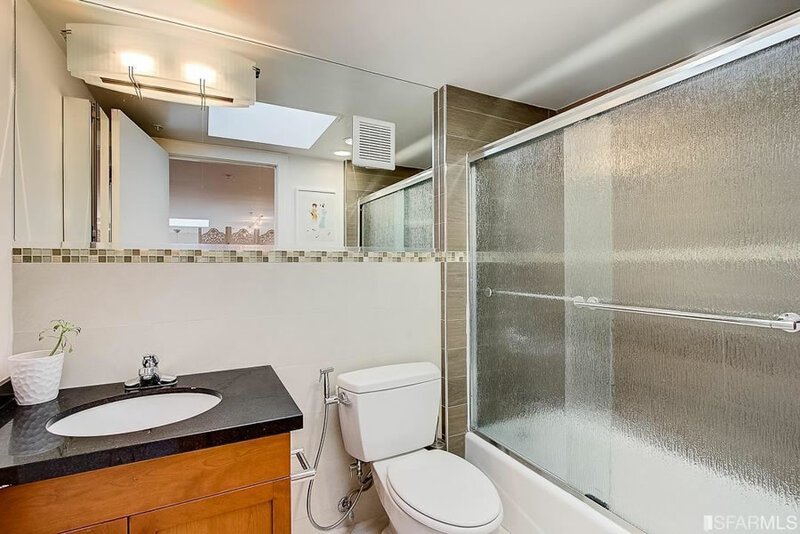 As far as the selling price, I can’t claim to know the market in SoMa, but if I worked at Uber, had vested options or RSUs not subject to the lock up period I wouldn’t hesitate to cash them out at the IPO price and buy this place at $1M. There just aren’t that many SoMa lofts that come onto the market. So it’s really a one bedroom unit. D-I-V-O-R-C-E. Not sure how that affects how the seller approaches the transaction. Let’s see… low ceilings in the upper loft space, tiny kitchen with almost no counter space/cabinets, and those frosted windows lead me to believe there is no view or an awful view that they’re hiding. Not even worth $995,000. 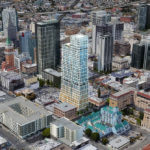 Perhaps that’s why the unit only fetched, and set a comp, at $1.185 million, or roughly $871 per square foot, back in 2015. 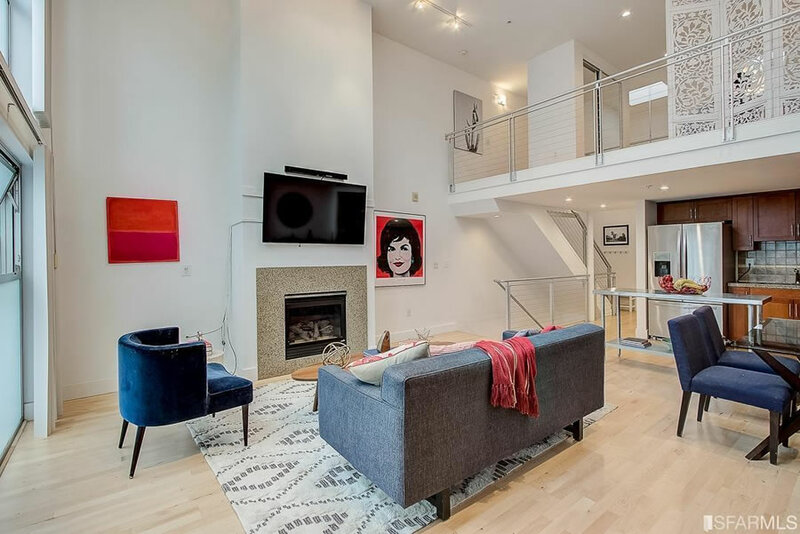 What makes you think the ceilings are low in upper loft space? Have you been in the unit? looking at the pictures, the ceiling is only slightly above top of the door. But isn’t that a feature of “real” (i.e. converted industrial space) lofts? So one person’s hair-skimming claustrophobia-inducing “low” is another’s “authentic”. Two years ago this same realtor was hyping ICOs. Where’s the Bitcoin boom now? 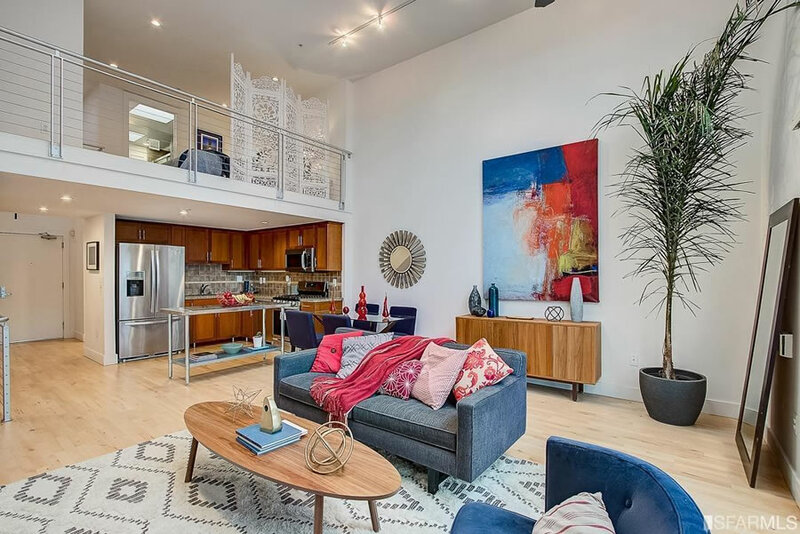 UPDATE: Stylish SoMa Loft Nearly Fetches its 2015 Price.